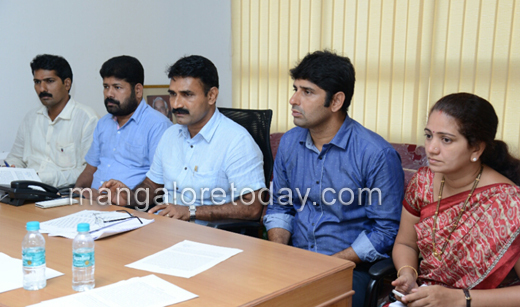 Mangaluru, Feb 26, 2016: Addressing media at his office at MCC on Feb 25,Thursday, opposition leader in Mangaluru City Corporation (MCC) Council Sudhir Shetty Kannur said the Opposition parties will file a complaint with the Lokayukta against mayor for misusing her powers. Opposition leader Shetty said a special meeting, convened by the mayor on Feb 24, was against rules and regulations. He said the meeting cannot be considered as a special meeting as the agenda did not comprise any special topics. Meetings can be called to discuss emergency issues or topics of utmost importance. A complaint has been submitted to the council secretary in this regard, he added. The mayor had passed a sanction order towards the SFC funds, following an anticipation of the approval by the council, even before chairing a council meeting. When the Opposition members demanded a discussion on the issue, the permission was denied and the members had to boycott the meeting, he said. Charging that the mayor had intentions to stop the opposition members from discussing important topics at the meeting, he said she has misused the provision of special meeting and added that it is a backdoor entry move to sanction works worth Rs 19 crore. The mayor does not have any right to grant prior permission to development works, following an anticipation of the approval by the council, he claimed. Opposition leaders Premanand Shetty and Roopa D Bangera were present among others.